This textbook provides an overview of the origin and preservation of carbonate sedimentary rocks. The focus is on limestones and dolostones and the sediments from which they are derived. The approach is general and universal and draws heavily on fundamental discoveries, arresting interpretations, and keystone syntheses that have been developed over the last five decades. The book is designed as a teaching tool for upper level undergraduate classes, a fundamental reference for graduate and research students, and a scholarly source of information for practicing professionals whose expertise lies outside this specialty. The approach is rigorous, with every chapter being designed as a separate lecture on a specific topic that is encased within a larger scheme. The text is profusely illustrated with all colour diagrams and images of rocks, subsurface cores, thin sections, modern sediments, and underwater seascapes. 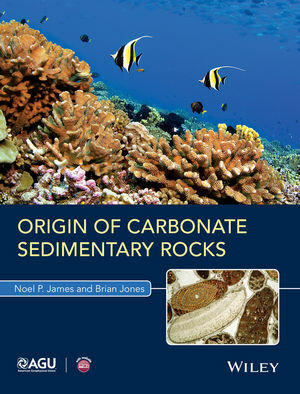 Noel James, Professor of Geology at Queen’s University, Canada, has, for over 40 years focused his research on carbonate sediments and rocks that range from the modern seafloor to the Archean, studying their origin via extensive marine and terrestrial fieldwork, petrography, and geochemistry. He has taught numerous courses on oceanography, carbonate sedimentology, petroleum geology and the evolution of North America to undergraduates, graduate students, and professionals as well as editing or authoring nine scientific books. He has been honoured many times by learned societies, is a Fellow of the Royal Society of Canada, and a Member of the Order of Canada. Brian Jones, Distinguished University Professor (Geology) at the University of Alberta, Canada, has, for over 40 years taught numerous courses at the introductory and advanced level on carbonate sedimentology and diagenesis. His research on carbonates has concentrated on the deposition and diagenesis of modern and Cenozoic deposits in the Caribbean, surface and subsurface Paleozoic rocks in the Western Canadian Sedimentary Basin, many of which are prolific hydrocarbon reservoirs, and spring deposits worldwide. He is a Fellow of the Royal Society of Canada, and the first Middleton Medalist of the Geological Association of Canada.